There’s nothing like a looming major natural disaster (in a state not used to major natural disasters) to test a new model of viewing Journal Register Company’s journalists in Connecticut as members of one big newsroom instead of disconnected silos. It also really helps when Steve Buttry is your company’s director of community engagement. He has used his experience leading a newsroom in flood-ravaged Cedar Rapids, Iowa, in 2008 to teach journalists about covering natural disasters. Among many tips and pieces of advice Steve has offered us on the fly was to have everyone who is going to be involved in this weekend’s hurricane coverage read Brian Stelter‘s account of his coverage of the tornado in Joplin earlier this year. 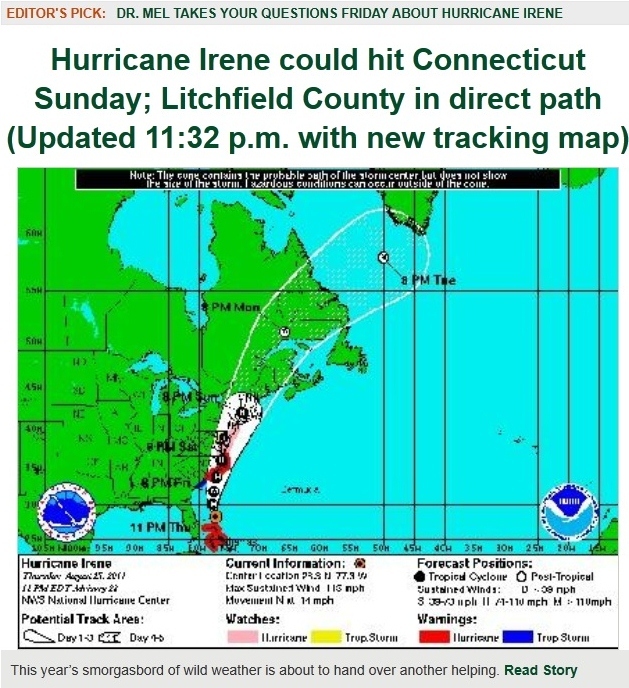 On Thursday morning, we kicked into high gear after hearing that Hurricane Irene is on a path similar to the Hurricane of 1938, which killed more than 600 people and is considered the worst natural disaster in the history of Connecticut. Editors at our three dailies, the New Haven Register, Middletown Press and The Register Citizen, along with weekly editors at the Litchfield County Times on Connecticut’s shoreline, exchanged dozens of emails, phone calls and Twitter messages Thursday divvying up coverage of Governor Dannel Malloy’s press updates, the latest tracking from the National Weather Service and other aspects of emergency management preparations. Reporters throughout the state were asked to start asking local officials about areas in their communities that are historically prone to flooding or tree damage. New Haven Register Entertainment Editor Jordan Fenster compiled them on a Google Doc spreadsheet, and from her office in Torrington, Register Citizen Community Engagement Editor Kaitlyn Yeager started syncing them up to a Google Map. The result was a series of embeddable maps covering our entire coverage area in Connecticut that visualized high-risk flooding areas for readers to avoid, as well as locations of emergency shelters and evacuation routes. Meanwhile, New Haven Register staff were lining up a live online chat with Dr. Mel Goldstein, the beloved Connecticut TV weather man who announced his retirement only a few days before the type of event that can be the highlight of a meteorologist’s career. 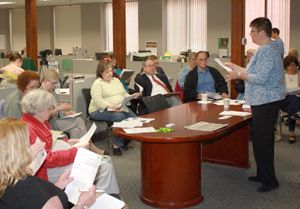 That’s scheduled for 11:30 a.m. Friday and will be embedded on Journal Register Company websites throughout the state. Weekend plans (the worst of Irene is now predicted to hit Connecticut during the day on Sunday) include an “all hands on deck” approach to staffing, but with designated editors clearly responsible for handling specific areas such as SMS text message alerts (something we are promoting heavily since the state expects widespread power outages, possibly cutting off Internet access for many), curation of readers’ reports on Twitter, Facebook and YouTube, handling the “rewrite” desk that will field phone and text message reports from reporters in the field, and processing and presenting staff and user-submitted photos and video. And the advantage of acting as one statewide newsroom, of course, is that one person can be marshaling SMS alerts or scouring YouTube for multiple sites, whereas those functions would require diversion from field reporting or likely not even happen in some parts of our coverage area if everyone was operating independently. Newsroom staff from across the state are also working together to make sure that we have a row of Netbooks with batteries charged, Droids and Flip cameras to put in the hands of reporters, and of course, rain gear. And to get that print edition out, a row of desktop computers are being loaded with all the necessary templates, logos and ad files, and will be driven to an alternative printing site should the New Haven Register lose electricity.